North American Flyball Association (http://www.flyball.org) NAFA is the largest governing body in flyball. United Flyball League International (http://www.u-fli.com) U-FLI is the newer governing body. Flyball Today (http://www.livestream.com/flyballtoday) Provides livestream flyball most weekends. Premier flyball box (http://www.premierflyballbox.com) These high-quality plastic boxes are made by Dan Phillips in Michigan. Synergy flyball box (http://www.synergyflyball.com/contact.htm) Designed by Kevin Hesse. Miller flyball box (http://www.millerflyball.com) Designed by Mike Miller. Tindall flyball box (eric@u-fli.com ) Designed by Eric Tindall in Michigan. Freda flyball box (http://www.flyballequip.com/flyballboxes.htm) Designed by Mike Freda. Fast Track flyball box (http://www.fasttrackflyballbox.com) Designed by David Dubois. Willoughby Workshop's box plans (with parts) (http://www.flyballequip.com/plans.htm) Includes plans and parts for 2-hole flyball box. gating anchors). Willoughby Workshop's jumps and sintra slats (http://www.flyballequip.com/flyballjumps.html) Also includes free jump plans if you want to build them yourself. Paul Ferlitto's Sintra flyball jumps and props (runndogs@gmail.com) Paul is located in Alabama. "Skid boots" (http://webpages.charter.net/dhfm/ZControl.html) Reusable foot wraps made by Kathleen Hansen. Foam balls at Oriental Trading Company (http://www.orientaltrading.com) Search on "foam ball" (there are different sizes). Tuff-Spun mats (http://www.crown-mats.com/products/tuffspunrolls.html) Crown Mats (choose 3/8-inch mat, usually in 3-foot x 60-foot rolls). NAFA News Yahoo group (http://pets.groups.yahoo.com/group/NAFANews) Announcements from the North American Flyball Association. U-FLI Announcements Google group (http://groups.google.com/group/ufli) Announcements from U-FLI. NAFA's Flyball Locator (http://www.flyball.org/getstarted) Lists regional email groups and websites by state/province. The Flyball email list (http://www.flyballdogs.com/email-list.html) This list has been around since 1995 and has thousands of members. It is rarely used nowadays but it's still good to know about. The Flyball Blog (http://www.flyballblog.com) This blog, run by Larry Worrilow, has been around since 2007 and contains a lot of great posts about training and flyball politics. Susan Garrett's blog (http://www.susangarrettdogagility.com) Although Susan writes primarily about agility, she has some great posts about building killer recalls on dogs and other general performance-related content. DogSport magazine (http://www.dogsportmagazine.com) Regular coverage of flyball, mixed in with articles about agility, disc dog, obedience, dock diving, weight pull, and feature articles about training dogs for all levels of competition. This book has been enthusiastically embraced by the agility community, and has a lot to offer owners of flyball dogs as well. McDevitt's methods help build focus and confidence in dogs that have difficulty concentrating or working off lead in a stimulating environment (which is pretty much what any flyball class, practice or tournament is). My club used several of the exercises in this book to get my Border Collie Kraken (the herder) ready to compete. Miller explains clicker training in layman's terms and walks you through, step-by-step, how to train a variety of basic commands using her positive methods and principles. 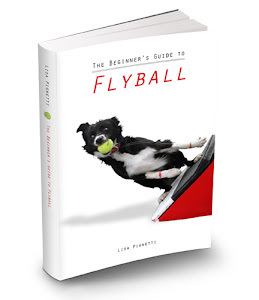 A superb foundational book for flyball training. I loved this book because I've always had at least three Jack Russell Terriers running around my house, and Killion's quirky Bull Terriers remind me of them. Killion teaches you how to work with "impossible dogs" by leveraging their natural behaviors to achieve success in the performance world. Her methods really work, and she includes lots of photos to illustrate her points. Distracted, unmotivated pets can be transformed into focused flyball machines with the right training – this book will help you get there. There is so much great information you can pull from this book to help you with flyball training – how to build a great recall, how to become the ultimate reward to your dog, plus exercises for getting tentative tuggers to tug and reluctant ball retrievers to retrieve. All presented with a very positive training style, backed up by behavioral science. Plus, Donaldson is really funny. These are the kinds of books you'll find yourself poring over when you've shifted from the "pet dog" mindset to the "canine athlete" mindset. Zink is a veterinarian and an authority on dogs as athletes, and her books educate dog sport competitors on conditioning, feeding, structure, and performance-related injuries. A fantastic book about dog structure and movement. Elliott teaches us about dogs' gait and how it relates to physical activities such as flyball, and she includes many sketches and diagrams, all based on actual "moving x-rays" of dogs running on a treadmill from Harvard's zoology lab. Ruff Love by Susan Garrett One of the first dog training books I ever read. Garrett's focus is on building a great relationship between you and your dog before you let him have full run of the house or play with your other dogs. Her book teaches you how to create a great work ethic in your dog, which makes it especially good for people with new puppies or easily-distracted adult dogs. Crash Test toys (http://www.pathcom.com/~crasher) Great flyball tugs (my Border Staffy Punk loves his real fur tug made from a recycled fur coat…and the bungee handle it's attached to saves my arm). Great for keeping your dog happy while he's crated on a roadtrip or at a tournament. Good flyball motivator/reward for dogs who love frisbees because it's soft and can be used like a tug, or even tied onto the end of a tug. Chuckits are a great way to condition your dog. These are just like regular tennis balls, except lighter and squishier, making them easier for dogs to get their teeth on and catch. Great for dogs who have trouble catching regular tennis balls. Flying Dog Outfitters Gorgeous handmade collars by flyball competitor Cindy Dalton. She makes the regular buckle collars (1" and 1.5") or martingales. I personally love the 1.5" martingales! Crown Matting (Tuff-Spun mats) Gorgeous handmade collars by flyball competitor Cindy Dalton. She makes the regular buckle collars (1" and 1.5") or martingales. I personally love the 1.5" martingales! Awesome little tool to help train all foundational flyball skills. We slice these in half and slit them lengthwise, then fit them on top of our jump props so that the dogs don't nick their toes on the top of the wooden props. My team's favorite foot/leg wrap. Its high tensile strength makes it tougher so it doesn't wear out as fast. It's easy to rip and wrap/unwrap, doesn't shrink if you dog gets his foot wet, and comes in lots of great colors. These are the exact gloves I have. They offer a lot of protection, but if you need even more than this, get the M-PACT2 style. Lisa Pignetti is a participant in the Amazon Services LLC Associates Program, an affiliate advertising program designed to provide a means for sites to earn advertising fees by advertising and linking to amazon.com.